The next race on the IM calendar is coming up soon: IM South Africa will be held on April 10th. 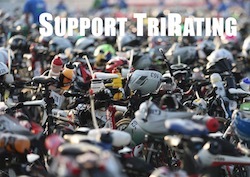 I’ve put together a preview for this race, based on the pro list (from early March) from their website at http://www.triangle.cc/event/default.asp?micrositeid=2. This list is almost a month old, so some changes are to be expected. IM South Africa is medium fast race with a course rating of 10:31. It is 8 1/2 minutes faster than IM Hawaii (course rating of 1:53), but more than 15 minutes slower than Challenge Roth (course rating of 27:41). The last few years, however, were pretty quick (race handicaps of 17 to 22 minutes), so if the conditions are right, the race can be fast (comparable to typical results at IM Arizona). it’ll be interesting to see the race between the established Marino Vanhoenacker (with excellent results over the last 6 seasons) and the newcomer Tom Lowe (whose single results from IM Arizona last November would be good enough for a spot on the TOP 10). The real question for the women’s race is probably not if Chrissie is going to win but how far up in the men’s field she’s going to end up. Based on the ratings, I’m calling a TOP 10 finish, but not much higher up if the people from the pro list actually show up. I’m quite interested in how Natascha Badmann is going to perform: Her last posted race is more than four years ago, and she’s had some up and down years in between. If she has a solid race, she should be able to finish runner-up. However, Rachel Joyce and Belinda Granger are solid racers that are not too far off – and they will try to make the race for TOP3 interesting.